To say we’re micro managers is an understatement. But that’s what it takes when you grow the best European bell peppers and eggplants in North America. Starting from the day the seeds are germinated we pay close attention to everything; from transplanting to irrigation, pruning and harvesting, no detail is too small. We even hand pack each vegetable to ensure you get the best produce possible. 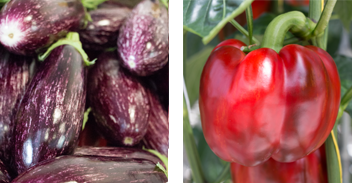 So the next time you’re shopping for the perfect red, yellow or orange bell pepper, or purple or graffiti eggplant make sure you ask for St. David’s. No one else offers the size, colour, texture and taste like we do.